Barring stray incidents of clashes and malfunctioning of voting machines at a few places, the polling was largely peaceful, including in areas affected by Maoist insurgency. An estimated 67 per cent of over 2.80 crore voters cast their ballots in Telangana on Friday in an election that will test the popularity of the ruling TRS supremo K Chandrasekhar Rao and the wisdom of the great gamble he made in going for early elections. Over 2.80 crore electorate are all set to elect their representatives for the 119-member Assembly on Friday. The voting began at 7 am and will continue till 5 pm. The state is witnessing a triangular battle between Congress-led alliance, the ruling TRS, and the BJP. In the fray are 1,821 candidates contesting from 119 constituencies. The state has a total of 32,815 polling stations across. Thirteen constituencies have been classified as Left Wing Extremist-affected where the polling ends one hour before (4 pm). Nearly one lakh police personnel including 25,000 central paramilitary forces and 20,000 from other states have been deployed in poll duties. The Congress alliance "Prajakutami" (People's Front) consists of the Telugu Desam Party (TDP), the Telangana Jana Samiti (TJS) and the Communist Party of India (CPI). Chief Minister K Chandrasekhar Rao (KCR)-led TRS is seeking a second term in office. The CEO said Income Tax and state government officials have seized unaccounted cash and other goods worth Rs 138 crore since the Model Code of Conduct came into force in September last week. Voter turnout of 56.17% recorded till 3 pm in Telangana. Voter turnout recorded at 56.17 per cent till 3 pm. With hundreds of people from Hyderabad heading to their native places to cast their votes in the Telangana Assembly elections on Friday, the state government decided to exempt them from toll tax. Chief Secretary S.K. Joshi issued orders to this effect following a request from Chief Electoral Officer Rajath Kumar. A man was taken into custody after he allegedly took a selfie while casting his vote at a polling station in Rajendra Nagar here Friday, police said. Jwala Gutta takes to Twitter, posts a video on her name not being on the voter list. "I checked my name online two to three weeks ago, my mother's and my names were there, my father's and my sister's were missing. Today we went to cast vote but my name was also missing. I don't understand how's my name missing. I've been living here for 12 years," said badminton player Jwala Gutta. Casted my vote in the #TelanganaAssemblyElections at booth number 17 of Amberpet Assembly Constituency in Hyderabad. Voter turnout in Telangana Elections 2018 is 49.15% till 1 PM. Leaders who cast their votes: Telangana and Andhra Pradesh Governor ESL Narasimhan and his wife Vimala Narasimhan, caretaker Chief Minister K T Rama Rao and his deputy Kadiyam Srihari, state minister Harish Rao, BJP Telangana chief K Laxman, former Union Minister Bandaru Dattatreya, AIMIM chief Asaduddin Owaisi and TJS president Kodandaram. BJP MP Bandaru Dattatreya casts his vote. Badminton ace Jwala Gutta's name goes missing from voter list. "How’s the election fair...when names r mysteriously disappearing from the list! !," she tweeted. The polling, which began on a dull note at 7 a.m. has picked up in the last two hours. Long queues of voters including women were seen especially in rural areas. Chief Electoral Officer Rajath Kumar said the polling has so far been peaceful and smooth. Telangana records 23.16% voter turnout till 11 am. According to information reaching the election authorities in Hyderabad, 23.17 per cent of over 2.8 crore voters have cast their votes in the first four hours. "Appealing to the citizens of Telangana to exercise their right to vote today. Remember that every vote counts and will make a difference," tweets TDP chief and AP CM Chandrababu Naidu. In a tweet, Owaisi alleged that Congress Nampally candidate tried to bribe voters. Telangana leaders Kadiyam Srihari, Harihs Rao, Pocharama Srinivas Reddy, Jupally Krishna Rao and Jagadish Reddy cast their votes. Voting turnout till 9.30 am in Telangana is 10.15 per cent. Actor-politician Chiranjeevi along with his wife K. Surekha stood in queue along with commoners and exercised their franchise. Chiranjeevi later told reporters that it is the duty of each and everyone to cast his vote. The former central minister and Congress party leader, however, parried questions about politics. "I came to here to cast my vote as a common citizen," he said when asked about the prospects of Congress-led People`s Front. Chiranjeevi, who had been focusing on films last four years, stayed away from campaigning in Telangana. Popular personalities from Telugu film industry cast their votes on Friday. Superstar K. Chiranjeevi, Akkineni Nagarjuna, director Rajamouli, actors Venkatesh, Allu Arjun, Amala Akkineni and Nithin were among the Tollywood personalities who exercised their franchise. They appealed to all citizens to come out and to exercise their democratic right. AIMIM chief Asaduddin Owaisi casts his vote in Hyderabad. Reports of Electronic Voting Machines (EVMs) malfunction emerging. Voting began late in few polling centres due to technical glitches in EVMs. BJP's G Kishan Reddy casts his vote at polling booth no.7 in Kachiguda, Hyderabad. Actor Allu Arjun stands in a queue to cast his vote at booth no. 152 in Jubilee Hills, Hyderabad. Voting is yet to begin at the polling station at GHMC Indoor Stadium, Amberpet, Hyderabad, due to a technical problem. Telangana: State Irrigation Minister T Harish Rao casts his vote in polling booth no 102 in Siddipet constituency. Out of a total of 280,747,22 voters, 1,41,56,182 are men and 1,39,05,811 women. The electorate also includes 10,038 service voters and 249 overseas Indian electors. 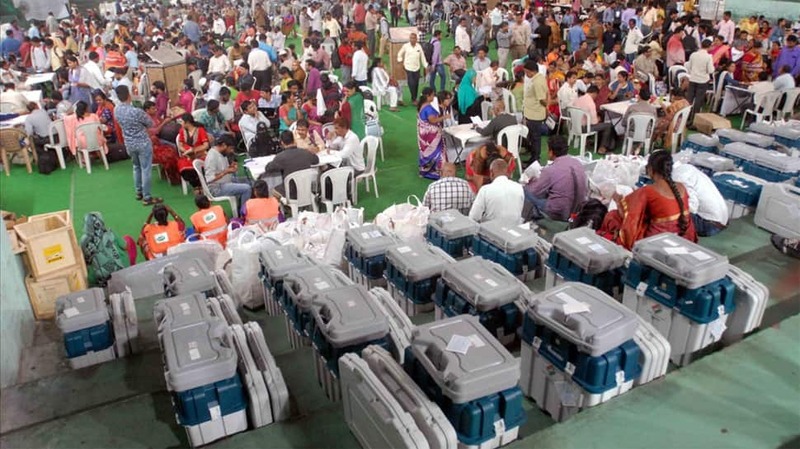 Serilingampalli constituency in Greater Hyderabad has over 5.75 lakh voters, the highest in the state, while Bhadrachalam in Khammam district has least voters - 1.37 lakh. According to Telangana`s Chief Electoral Officer Rajat Kumar, polling will be held from 7 am to 5 pm in 106 constituencies while in 13 Left Wing Extremism affected constituencies polling will conclude at 4 pm. Over 50,000 security personnel including 18,860 drafted from neighbouring states and central forces were deployed as part of the massive security arrangements. Election authorities have made elaborate arrangements for a smooth conduct of the polling process in 32,815 polling stations, he added. Bharatiya Janata Party (BJP)`s state President K Laxman is contesting from Musheerabad in Hyderabad, while All India Majlis-e-Ittehadul Muslimeen (AIMIM) chief Akbaruddin Owaisi is seeking election from Chandrayangutta in Hyderabad for a fifth consecutive term. Telugu Desam Party (TDP) founder NT Rama Rao`s granddaughter N. Suhasini is another key candidate contesting in these polls. Congress party`s Telangana unit chief N. Uttam Kumar Reddy, who may emerge as a strong contender for the Chief Minister`s post in the event of Congress-led People`s Front coming to power, is contesting for a third consecutive term. Revanth Reddy, another key contestant whose midnight arrest on Tuesday triggered a storm, is contesting from Kodangal - a politically sensitive constituency. Another Working President of Congress Mallu Bhatti Vikramarka is the party candidate from Madhira (SC). Former Central Minister Sarve Satyanarayana is contesting on Congress ticket from Secunderabad Cantonment (SC). KCR`s son KT Rama Rao, who is number two in both party and government, is aiming for a third term from Sircilla constituency. KCR`s nephew and cabinet minister T. Harish Rao appears set to retain Siddipet seat for the fourth term in a row. Among the other ministers, Etela Rajender, who holds finance portfolio, is testing his fortunes once again from Huzurabad. Telangana Rashtra Samithi (TRS) chief KCR is seeking re-election from Gajwel constituency in Siddipet district. The 64-year-old, who never lost an Assembly or Lok Sabha elections since making his debut in 1985, is confident of yet another victory. The assembly polls in Telangana were originally scheduled to be held simultaneously with the Lok Sabha elections next year, but the House was dissolved on September 6 as per a recommendation of the TRS government eight months ahead of the schedule in the hope of taking the Opposition parties by surprise.